Check in from 2pm. Check out 10:30am. Hostel reception is open 8am - 8pm October to February and is open 7am - 10pm March to September. Larger groups may be required to pay a security and damages deposit of £50 per person, which is fully refundable where no security or damage issues have occurred. All members of the group must present valid ID upon arrival and pay the £50 deposit by card before collecting key cards and gaining access to the rooms. Failure to comply with these terms will result in losing your booking. All rates quoted are inclusive of VAT and are subject to availability and alteration. All nights of accommodation must be paid for on arrival in full as stated in your booking confirmation and is non-refundable. If you wish to change or cancel your booking we require that you do 48 hours prior to arrival, failure to do so will result in a cancellation charge. If you booked via booking.com or hostelworld, you must cancel the booking direct with the agent. Personal information will not be shared with any third party. Guests are required to provide details of their credit card as a guarantee of their reservation. These details cannot be provided via email, bookings must be made online or via phone call. All statements or representations made by any Black Isle Bar employee will be of no effect unless it is stated in writing. Black Isle Bar will not be held responsible or any loss, damages or theft to client's properties within our establishment. 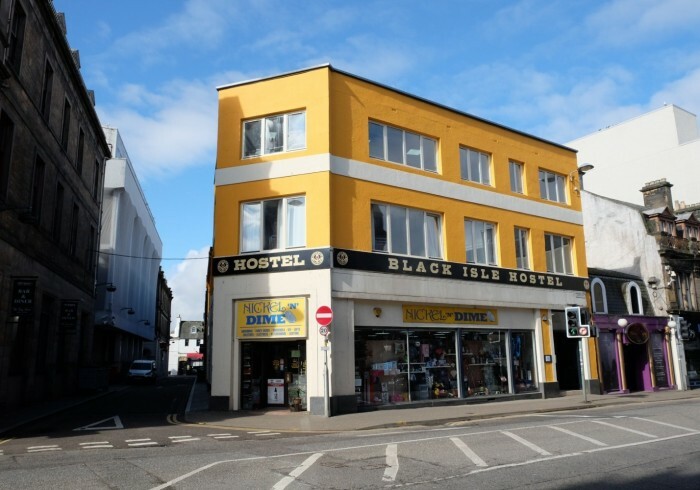 All disputes, if not immediately resolved by the hotel management, will be handled by the Black Isle Brewery Office - info@blackislebrewery.com. We reserve the right to reject your booking upon arrival if you appear to be aggressive or inappropriate to our staff. We reserve the right to charge your card for any damage or theft caused in the room. Charges will be deducted from the card details you have provided with your booking. £2.50 for failure to return key cards. £20 for smoking in our rooms. Full price of the room you stayed in if it is damaged beyond resale the next day.